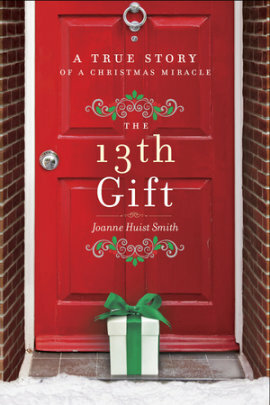 I requested this book, the 13th gift by Joanne Huist Smith, nearly a year ago. Right after the holidays. And after all the planning and gift wrap and sequins and bows I really had no interest in reading a book about Christmas. Yet here we are, in early November and I’m starting to plan Thanksgiving and Christmas (I know, I’m one of those.) I figured it was a great time to set the tone and start thinking about the holiday season! The 13th gift is a memoir, “A True Story of a Christmas Miracle,” of a family in the wake of the father’s unexpected passing. The author doesn’t go into the details of his death, other than he had a heart condition and passed in his sleep, but rather the book is about how a stranger’s unexpected kindness, in daily gifts, brings the family back together. At the beginning of the book, Joanne and her three kids are falling apart. School is skipped, meals are not made, emotions are raw. But 12 days before Christmas they receive a gift on their front step. Each day another gift appears. At first Joanne does not like the gifts, but after a few days the gifts bring the family back together until the family realizes that even though they lost a husband/father, there are still people that love them and are looking out for them. By the time Christmas day arrives, the family has put together a holiday to remember. And by the time I finished the book, I was in the holiday spirit. I’m making lists and planning meals (because yes, I’m one of those.) Joanne and her family lost an integral part of their family that year, but with the help of strangers, and loved ones, they were able to find themselves and each other. If you’d like to read it, leave a comment and I’ll share it with a lucky reader. I can’t be the only one starting my holiday shopping already. It’s been forever since I stopped by. Good to see you’re still writing…much more often than I have been. If you still have the book, I’d love to read it.